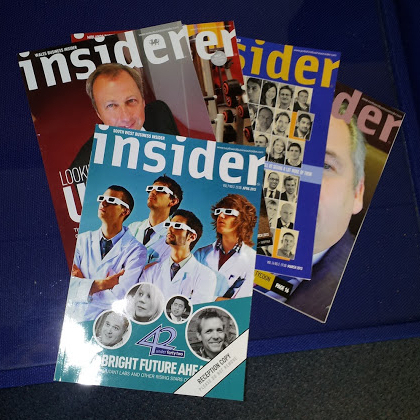 A couple of weeks back, I started work at Insider Media. It’s a business-to-business media company based in Manchester that runs events and publishes various magazines across the UK – magazines like North West Business Insider. I’ve taken up the post of digital staff writer. Basically my role involves sourcing and writing exclusives for daily newsletters, covering subjects like mergers and acquisitions, funding, manufacturing, property and – well – business. In other words, business journalism. It’s still early days but I’ve really enjoyed the job so far and I’m chuffed to be putting my journalism training to some use. Anyway, I’m working full-time so I’m not going to be accepting any copywriting, SEO copywriting, proofreading, copy editing, PR or social media marketing freelance work in the near future. I’ve got more than enough on my plate already! However, I’ll still be keeping this website going, and I’ll still be posting blogs here whenever the mood takes me. So the same as before really. It’s been a crazy few weeks, it really has. Little over a month ago, I came back from South America with nowhere to live and (almost) no money. Now I’m renting a great flat in Chorlton and I’ve got a fantastic job in Manchester city centre. I’m still not quite sure how everything sorted itself out so quickly – just lucky I guess.